I was teaching a “saddle club” group lesson the other day with my teaching partner, a lovely lady who is passionate about teaching “riding lessons”. She does not, however, have the background I have in working with children, children with special needs and in the counseling/social work field. She has a 1:1 student-we’ll call her Jane-who also participates in our weekly girl’s group “Saddle Club” riding and education class. My partner has expressed to me frustration in teaching Jane. You see Jane is ten years old, but presents as somewhat slow, unfocused and doesn’t seem to progress in riding skills. During the group lesson, Jane was having difficulty and really holding up the class. She was on a new horse, and could not even get the horse to MOVE. My partner expressed quietly to me that she was increasingly frustrated with Jane and simply losing patience…she expressed that she doesn’t know how to “get through to this girl”. I suggested that we split the group and one of us could take Jane individually so the others would be allowed to continue on with the group lesson. I told my partner that if she wanted I would be willing to work one-on-one with Jane today. She said “yes, please!”. I took Jane to the far end of the arena and started working with her. After some time I picked up on some patterns she was displaying. And I picked up on some tension in her body. I picked up on her fear. I asked her about it and she expressed that she was terrified. So we broke it down, took it literally ONE step at a time. I did some focus excersices with her that I do with my riders who have special needs and/or fear trauma issues. I find it really brings them into the moment, gives them a focus and reduces the anxiety build up. Jane then began to relax and by the end of our time together she was circling her horse around a barrel and back to me, over and over. Thus-as I pointed out to her-showing her that she has control and knows what to do, even beyond her fear. With intention, her horse will respond. It was an amazing 20 minutes. Later, my partner expressed to me that she wishes she had my patience. And that she feels like the parents are “wasting their money” on lessons. I responded back that, perhaps she was looking at this wrong. No, it’s not a “waste”. My partner is focused on “riding lessons”. She wants to see Jane progress in her RIDING. Sometimes, I told her, when I have a child like Jane who has some special needs (in this case, fear), I realign my intention-this is where I firmly believe that riding is therapy. Ok, I do have my “regular” riding lessons. And, yes, I enjoy seeing my girls win their ribbons at shows. My passion, though, is with the deeper stuff. 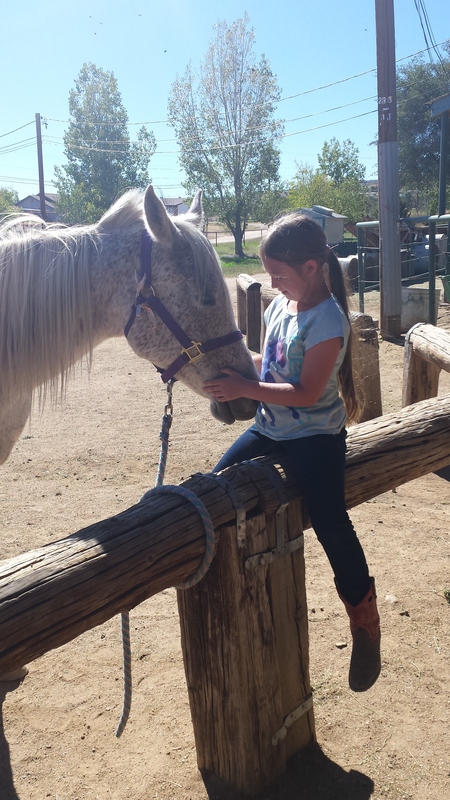 What Jane can do and learn through horseback riding is priceless and worth far more than those ribbons. She is an extremely timid, shy, insecure girl. I suspect, but don’t know (and won’t address because she isn’t my student) that there may be some disability (alter-ability) such as mild Autism or something developmental. Jane is gaining so much more from this experience than my girls who bring home the ribbons are. I promise you that. Strength, focus, confidence, assertiveness, perserverence…. Just getting up on a horse for her is more brave and amazing than you can imagine. AND this is a form of therapy that she LOVES to go to and participate in. Do you know how many kids tell me they hate going to therapy??? So boring! And, all while they sit on the back of a horse in my therapy (office) arena. It really is a beautiful thing. I’m so happy you had the insight to work one-on-one with that rider. What a wonderful opportunity for her. Well done. And a wonderful opportunity for me :). I feel “at home” in situations like that.Thank you so much for your comment and support. Thank you so much. That is so kind 🙂 Not much is more enticing in terms of “therapy” than a horse for a child! Thank you so much. That means a lot to me. I completely get what you’re saying about growth as a WHOLE person. Riding, horses have so much more to teach us (and especially our children) about who we are if we ate just open to it. Yes, of course. And thank you! This is such a wonderful post! I, too, work with children who have special needs. Your perspective and compassion are moving. Thanks for sharing! Thank you. That means more to me than you know. You are most welcome! You write such interesting and thoughtful posts. Thanks so much for sharing! I love this post, and Jane is so very lucky to have you. Thank you. I feel lucky too :). Honestly, that is where my heart and passion are so it soothes my soul as much as hers! This is a wonderful post by the author of barnraised. Her compassion for children who have special needs is moving and inspiring. Wow. Thank you so very much :)! That’s so funny that you ask that because I have recently had that exact issue come up. With a young and very timid girl who is definitely not progressing in riding skills. I specialize in teaching to children with special needs so most people come to me knowing what I do and that it is therapeutic, however I do have students that are not necessarily “special needs” and I just teach regular riding lessons to. This particular girl was not “special needs” per se just extremely timid and nervous. Her mom had visions of her jumping and showing and displaying quick progression. I finally had to have the uncomfortable conversation with her mom and I just tried to be honest and respectful. I pretty much told her that her daughter’s personality is very timid and sensitive which is a beautiful thing. I said that that was also perhaps why mom wasn’t seeing a lot of progression in her riding. Then I said that what I’d like to do with her daughter is do some games and therapeutic exercises to help her work through some of her nervousness of the horse and work on being more assertive. Mom was surprisingly receptive to this and she agreed that she would like to see her daughter become more confident and assertive. that one turned out great. I have had a few students who stopped coming for lessons because they weren’t progressing and I think their parents kind of felt like it was a waste of time and went on to something else without really understanding why it wasn’t working but that’s been few students. I think for the most part parents get it when I talk to them about it in an honest way. Then they know what they’re in for and they can decide if they want to keep coming. I really like this, and I share your vision of teaching. I think it’s also much more fulfilling for the teacher this way. I would be interested to know how you explain this to parents. What do you say to them when they happen to be more “performance oriented” and expect that if their kid takes horse riding lessons, then their horse riding skills should improve, period. I loved doing homework help when I was a student, but I sometimes found it hard to convince parents that even though their kid’s grades didn’t seem to improve, they were still making considerable progress (like getting more confident, etc). I replied to your comment and question. But now that I look back, it appears as a reply to a different blogger. Sorry! Please read my above response. I’d like to know your thoughts as well! Thanks! It’s very interesting to read about your experience. The honest talk with parents is also the only good way I can think of. I think that appearing very confident about the benefits of your teaching for the kid is very important. I have also mostly experienced positive feedback when talking that way to parents. But then I guess sometimes it’s still hard for them to resist to the social pressure and fear for the kid’s future. Our societies put so much importance on excellence. Too often we only look at the results and neglect the importance of the learning process. – I think it’s a very good thing that teachers who share the vision you’re presenting here put it out there and defend it. Like you did with this post! I agree, the social pressure is hard. Add in the horse factor in my situation, parents who don’t “know” horses don’t understand how hard horses can be and how much skill it takes to work with them. They expect that their child will just hop on, horse will do what it’s supposed to and everyone looks great. You say it so perfectly…that we often only look at the results and neglect the learning process which is (in my opinion) the part that actually matters, that teaches, that makes us who we are. Thank you so much for your positive and supportive words! Nothing embarrassing about that! It is very healing though. Interestingly, I teach an amazing lady who is also a chronic pain sufferer. She uses riding for therapy. She tells me “I hurt anyways so I might as well hurt from having fun”. It can be. My student has a gaited horse which means she moves different from other horses and it’s a very smooth ride. But closing your eyes and imagining has the same effect. I’ve read lots of studies on that. With anything, not just riding. It’s all about the state of mind!